A few months ago Jinnie and I met Rachael and Emma, the co-founders of [reads], a book subscription service that treats subscribers to two surprise books each month — one art, photo, or design book, and one narrative prose book. 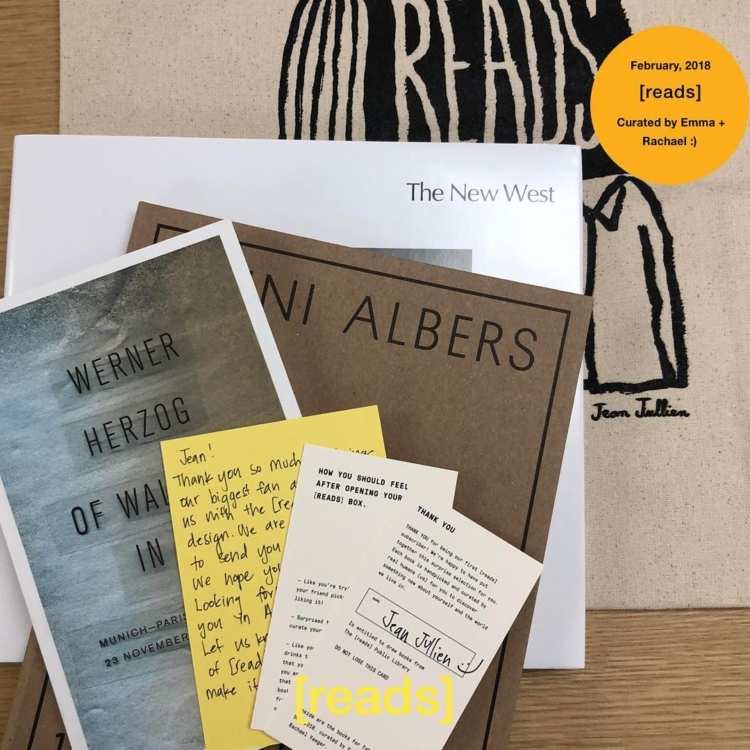 (Their February box, for example, featured Anni Albers: Notebook 1970-1980, Of Walking in Ice by Werner Herzog, and The New West by Robert Adams.) They recently began hosting a series of “literary dinners,” which include a three-course meal, drinks, a reading by a special guest author, and the author’s book to take home. “The foundation of [reads] is centered on building conversations and cultivating a community,” they wrote of the dinner series’ inspiration. “We wanted to create a space where we could invite a stranger into a home and make them feel like family.” Their first guest author was Durga Chew-Bose, whose Too Much and Not the Mood is an intimate book of essays full of tiny-yet-affecting observations about daily life, family, and friendship. You can read more about the dinner here. Now, Jinnie and I are excited to share that we’ve helped to curate their next literary dinner, which will take place on March 4 in Greenpoint, Brooklyn. The evening’s special guest is recent PEN America Literary Award-winner (!) Jenny Zhang, whose short story collection Sour Heart ripped ours to shreds and put them back together again. Dinner will come from the heart and hands of our friend Diane Chang (aka Eating Po-po’s). Want to join us? All of the info is right here.